Athletics at Xavier is more than just a game. It is an important part of the Jesuit philosophy of education that stresses the development of the mind, body and spirit of each student. 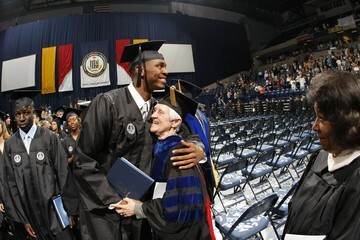 Xavier is consistently among the top schools in the nation for student-athlete graduation rates. In the most recent Graduation Success Rate, as measured by the NCAA, Xavier student-athletes graduated at an impressive rate of 94%. The Office of Student Athlete Academic Support Services (SAASS) is located on the 2nd floor of the West side of the Cintas Center. Director, Angela Wyss, Assistant Director, Chris Barbour, and Advisor and Life Skills Coordinator, Stephanie Hurley, work with designated teams, giving the student-athletes a familiar contact for academic help. The SAASS Office offers academic monitoring, and support, as well as assistance with class registration and course selection. The office also oversees both a freshman and upperclassman study tables program. Every freshman student-athlete at Xavier is required to attend study tables for 8 hours a week, every week of their first semester, whether in or out of season. Tutors are available at the request of the student-athlete. Another aspect of academic support offered by this office is a comprehensive tutoring program which provides tutoring support to student-athletes in nearly every academic field. The SAASS Office employs approximately 12 adult professional tutors and collaborates with the Xavier Learning Assistance Center (LAC) to provide student tutors to work with the student-athletes. Also available through the LAC are supplemental instruction (SI) sessions in the fields of biology, chemistry and anatomy and physiology. The SAASS Office also includes a comprehensive Life Skills Program, which provides programming and support in the areas of personal development, career development, and service to the community.